How many colors do you see? It looks like a crayola crayon box! 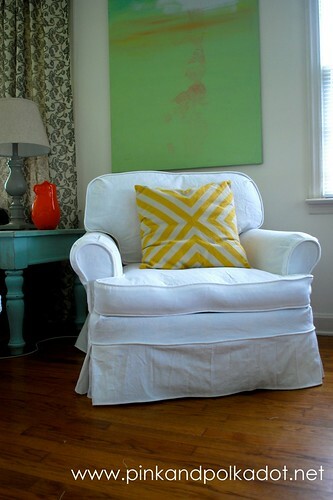 And that is exactly why I love white slipcovers! They go with any and everything. 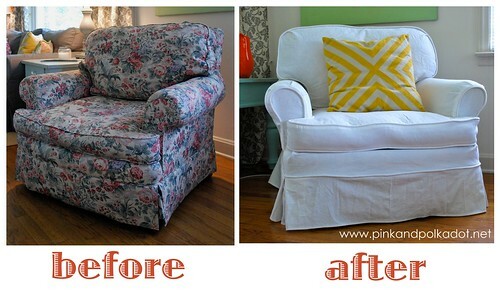 I’m just finishing up this slipcover and matching ottoman for a client. When in doubt…go white! Just rip it off and throw them in the wash with bleach. I’ve also used borax with detergent and it seems to work well. 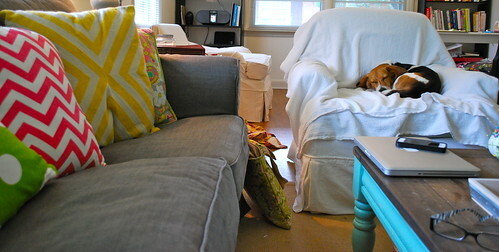 Real life…Slipcovers were made for pets. Ally in her chair! What is your source for white brushed twill…I'm guessing that's what you use??? thanks! Oh, I heart Ally… good beagle! That's an amazing before & after, nice job! Love it!!!! I'm curious, did you also make the pillow? I love the fabric with the yellow and am wondering where it's from.